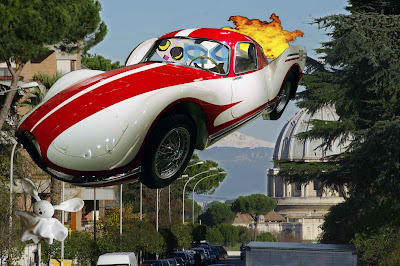 Ghost Bunny made sure that the dreaded Agents of Rabit were long lost in the clouds above Turin and quickly guided Turbina the Jet Car into Rome. “I’m looking forward to being undercover,” said the Wabbit. “I got you a series of posts at various stalls in the City,” replied Lapinette. “But I wanted to be a news vendor,” said the Wabbit. “And so you shall,” said Lapinette, “but through my various contacts, I have arranged a short period where you will sell good luck charms.” “Oh lovely,” said the Wabbit, “and what shall I wear?” “Just your normal coat,” said Lapinette. “Then what am I taking for luck?” said the Wabbit. “Me,” said Lapinette. Turbina the Jet Car hooted his horn and his after burn left a long vapour trail in the cold air. The Wabbit smiled and nodded his head. “I am still uncertain what the mission exactly entails,” he said. “The less you know the better,” said Lapinette, “so keep your ears keen, your eyes open and get ready to hop when the time is right. “Is it about organised crime?” said the Wabbit. “All crime is organised,” said Lapinette. “Is it about injustice and exclusion then?” asked the Wabbit.” “Everything is,” said Lapinette. “Recovering a lost object?” asked the Wabbit. “We are all lost and found,” said Lapinette. “Uncovering a dastardly plot against us wabbits,” said the Wabbit. “I’m not saying,” said Lapinette. “Then that’s it,” said the Wabbit and he thought for a while. “So what are you taking for luck?” he asked. “A Beretta 93R machine pistol,” said Lapinette.